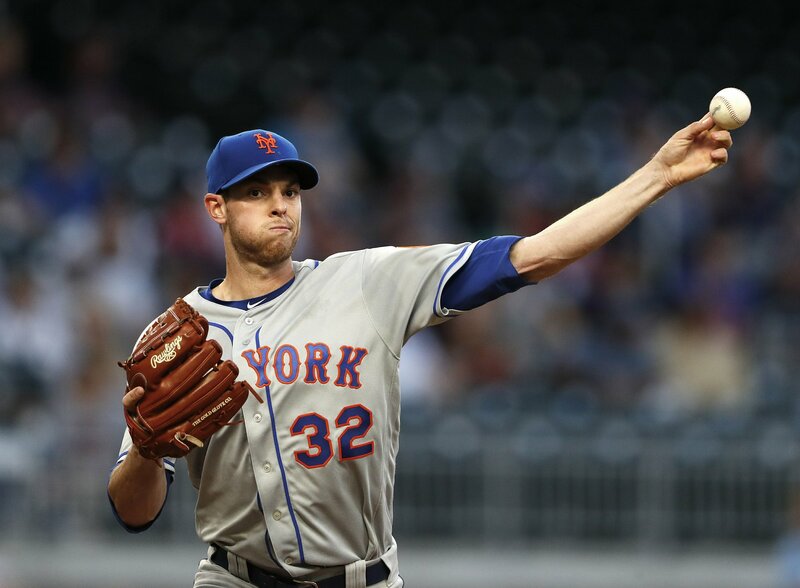 The New York Mets (7-4) defeated the Minnesota Twins (6-4) by a score of 9-6 Wednesday night at Citi Field. Noah Syndergaard was outstanding through seven innings before faltering in the eighth, but the Mets had put up a six-spot against the Twins in the fifth inning thanks to seven straight free passes. Noah Syndergaard cruised through the first seven innings, the only blip being in the third inning when an infield hit, sacrifice bunt, and bloop hit led to a run. Up 9-1 going into the 8th inning and Thor still on the mound, the Mets brought in replacement players to get some playing time which might have jinxed it. Syndergaard, who had been lights-out to that point, allowed a single to Mitch Garver, a double to Jonathan Schoop, and a triple to Byron Buxton before recording an out. That would be it for Syndergaard who was replaced by Jeurys Familia. The Twins jumped on Jeurys as the first pitch he threw was put in play for an infield single, scoring Buxton and closing the book on Syndergaard. His line looks far uglier than he deserves: 7 IP, 5 H, 4 ER, 0 BB, 7 K.
The second pitch Familia threw was lined to right center by Max Kepler, putting runners on second and third with still nobody out. Pitching around Jorge Polanco with the open base, Familia worked a full count before walking Polanco to load the bases — The sixth straight Twin to reach base to start the eighth inning. Willians Astudillo, who never walks or strikes out (85 walks and 81 strikeouts in 2461 minor league plate appearances), grounded into a 5-4-3 double play. While the run scored, Guillorme’s turn was lightning fast to get the double play. His turn was so fast that it warranted a challenge by the Twins, but the call on the field was upheld. A groundout to second base by Eddie Rosario ended the inning with the Mets now up 9-5. Edwin Diaz came in the for the ninth inning despite it not being a save situation — The last time he came in with a four run lead, he loaded the bases before striking out three consecutive batters. This time, after striking out C.J. Cron, Mitch Garver (who hit two home runs against Jacob deGrom Tuesady night), hit a home run to the M&M deck to make it 9-6 Mets — the first earned run Diaz has allowed as a New York Met. Jonathan Schoop then squeaked a base hit through the 5.5 hole to bring Byron Buxton to the plate. A wild pitch moved Schoop to second, but Diaz struck out Buxton for the second out and Ehire Adrianza for the last. After being no-hit by Twins starter Jake Odorizzi through the first four innings, the Mets got things going in the fifth with their first hit of the day, a one-out bloop single to left field off the bat of Jeff McNeil. Amed Rosario then drew his second walk of the evening, pushing McNeil to second, before a J.D. Davis walk loaded the bases for Noah Syndergaard. The first pitch to Thor soared to the backstop, prompting all the runners to take off. The ball caromed hard back to the catcher, though, and McNeil was caught between third and home. The catcher tossed the ball to the pitcher covering home, and Odorizzi quickly gunned the ball to third to snag McNeil for the second out of the inning. Syndergaard then walked to load the bases, and the third walk of the inning by Odorizzi would be his last of the day. With Brandon Nimmo coming up, Twins manager Rocco Baldelli went to the bullpen despite the fact that Odorizzi had struck Nimmo out twice already. Lefty reliever Andrew Vasquez, making his first appearance of the season, hit Nimmo with a pitch to force in a run. Pete Alonso came up with two outs and the bases loaded in a 1-1 game. After falling behind 1-2, Alonso worked a walk to earn an RBI and give the Mets a 2-1 lead. The first and third pitches to Robinson Cano almost decapitated him, but he stayed in the box to earn a four-pitch walk, forcing in another run. Trevor Hildenberger was brought in with the bases still loaded to face Michael Conforto and immediately walked him on four pitches. Wilson Ramos, who started the inning with a groundout, got ahead 2-0 and instead of taking like everyone else, he grounded a base hit to right field, scoring two. Jeff McNeil then struck out, so to recap, the 5th inning went as follows: Groundout, single, walk, walk, walk, hit-by-pitch, walk, walk, walk, single, strikeout. 6-1 Mets. Wilson Ramos struck out for the first out before Jeff McNeil socked another hit to left field, scoring Luis Guillorme who had pinch-ran for Cano. Amed Rosario struck out swinging before J.D. Davis grounded into a fielder’s choice at third to end the inning. Juan Lagares led off the bottom of the 8th inning as a pinch-hitter and worked a walk. Dominic Smith, batting in Nimmo’s spot in the order, struck out while Lagares stole second on strike three to put a runner in scoring position for Keon Broxton. Broxton, batting in Alonso’s spot in the order, went down on strikes for the second out. Luis Guillorme, batting in Cano’s spot, grounded out to second base to end the inning. The Mets travel down to Atlanta to face off against the Braves Thursday night. Steven Matz (0-0, 0.87 ERA) will face off against Kevin Gausman (1-0, 0.00 ERA) with first pitch scheduled for 7:20 PM ET at SunTrust Park.